Peruse the forums on what people think of a shop's customer service. It matters because the quality of some Land Rover parts at the cheaper end of the market can have dubious quality, so a decent returns policy and accommodation of the retailer comes into play. For the most part, a return of a dodgy part will see the retailer knocking on the door of the distributor (Britpart/Bearmach/etc.) 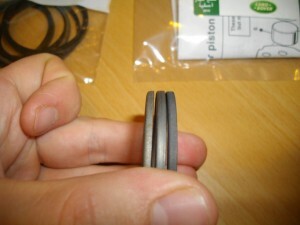 to get their own money back, so there should be no problems in sending a part back that is not fit for purpose. When buying online (in the UK), you have a legal right to return any item for a full refund within 7 days. Sometimes the retailer might also make a mistake. I have ordered genuine parts and received pattern parts instead. The retailer in question was LRseries, but promptly replied, admitted the mistake and sent out the genuine parts at no extra cost via first class post. In this instance, it mattered to me that I was using a reputable business. There are plenty of stories of retailers sending pattern parts when Genuine parts were ordered, the customer feeling short changed and the retailer arguing back. There may be a legitimate cause that a Genuine item was repackaged as Bripart, but if it doesn't give solid clues that it is a Genuine part, then what else can you go off? Reputation is what matters when things go wrong. 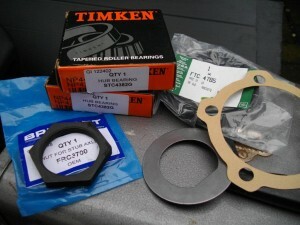 See our retailers section for reviews of some online parts shops and add your own! Does the postage fee adjust with the order? Postage can be a really expensive part of a placing an order online, so it pays to look around at different websites. Some retailers are very upfront about their postages costs, whereas some you have to get all the way to checkout (having created an account) to be dismayed at the extortionate postage cost. Retailers such as Island 4x4 and John Craddock waive the postage fee if you spend more than £50. This is useful if you want to order several heavy things. Some retailers charge a flat fee, like LRseries, which makes ordering smaller items quite expensive. For items like a single bolt, gasket or seal, LRdirect charge based on the weight of the item, so for small and light orders the postage could only be a couple of pounds. Retailers have to balance they way they operate by either having stock on the self that can be dispatched quickly, or having to order via the distributor first. This is the case with more obscure and unique genuine parts, which can take up to 3 days to arrive at the retailer from the warehouse. With Bearmach, some retailers are able to have the item sent to you directly from the Bearmach warehouse if they have no stock, cutting down time. This would tend to be if you were ordering a single item, as happened for me when buying a section of exhaust. Retailers will try to combine a single order into a single delivery to cut costs, so if you buy multiple items, of which some they have stock and some they don't, they will order the required stock to their depot before combining the order into a single delivery. Some retailers may order the stock to their own depot regardless, so that it can be repackaged in their own branding before final delivery. This can escalate the time from order to delivery quite dramatically. Some retailers, as I have found to my dismay, don't have sophisticated enough websites to remove the "Next day delivery" option if they don't have the part in stock. It ends in a bit of a stalemate because the customer wants the parts the next day, but the retailer is only supplying the next day service from the moment of dispatch, so the customer ends up paying more for a service they didn't get, all because of the retailer's unequipped website or their lack of stock. Part websites that show their stock levels are a really good indicators for what to expect, and if there is an error in slow dispatch then it puts the power in the hands of the customer. If you want to place an order for a few urgent parts, and some that aren't so urgent, consider splitting your order across different retailers, because the non urgent parts may require a few days to arrive from a distributor and that will delay your entire order. Do they give a choice of brands? I find this an extremely important point, that the retailer gives you control over which brand you are ordering. With some retailers, the part is shown as a generic listing and you will have no idea what kind of brand or manufacturer is responsible for it. 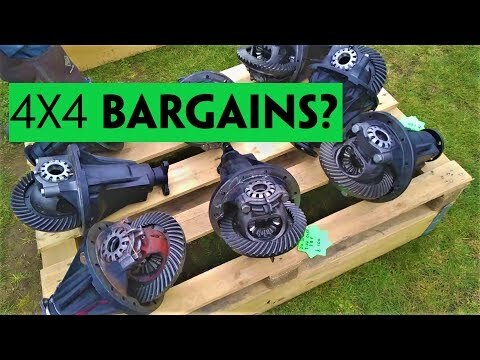 We live in a time where the sale of new parts is so competitive with many distribution brands fighting for our money, and the choice of whether to buy genuine parts or not can be really important for safety critical items, that we really should be able to specify what we want to spend our money on. I really want to see a increase in the quality of parts available for Land Rovers, because it is only because people buy cheap parts and put up with shoddy quality that these parts are still available. If the retailer gives us a real choice in the matter then we can go some way to influencing this by what we spend our money on. 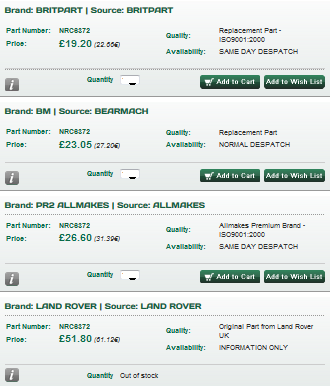 Retailers such as LRdirect, Brit-car and LRseries are great for being able to choose which brand of part you want to buy. The new parts market is so competitive, that all businesses selling Land Rover parts have to squeeze their margins to get their sales. There will always be a minimum price they can go to however, so that they are still able to make a profit. What this means is that when you see the same part listed for £5, £15 and £40 across different brands (Britpart/Bearmach/etc. ), it does not mean that they are the same part but the profit margin is increased on the more expensive item; infact it may be the reverse. The spectrum of prices broadly shows the amount of money that has been spent on manufacturing each part. If we only ever look for the cheapest part, rather than the best value part, we will only ever get rubbish parts. The one exception may be Genuine parts, because they have a markup due to their monopoly on this niche area of parts, but by and large if you spend more on a part, you will get a better part. This site aims to help you get the best value part for your money.